I have to admit I enjoy being on the PR circulation for this sort of stuff. I’m in the industry, I’m a fan, thanks for sending this over Falken Tire. Welcome to the races! GT-Rs hit Buttonwillow Video Option style. YouTube – FIRST LOOK: GTR Battle, The Movie. Bittersweet video for me, I was invited to attend this video shoot but wasn’t able to make it, now after watching this video, I feel completely stupid for not attending…oh well. Great stuff. HD version on Vimeo. Twins Turbo Mazda RX-7 (FD3S) breaks Super Lap Bat- Video. I have to admit this looks like a ton of fun. Video: Nissan GT-R at Nurburgring in Winter. I’ve seen this car race before and I have to say it sounds far cooler from the inboard camera. Most impressive. bmw m3 gtr nurburgring nordschleife 4th vln run qu- Video. Did the GT-R SpecV do a 7:20 Nurburgring time? 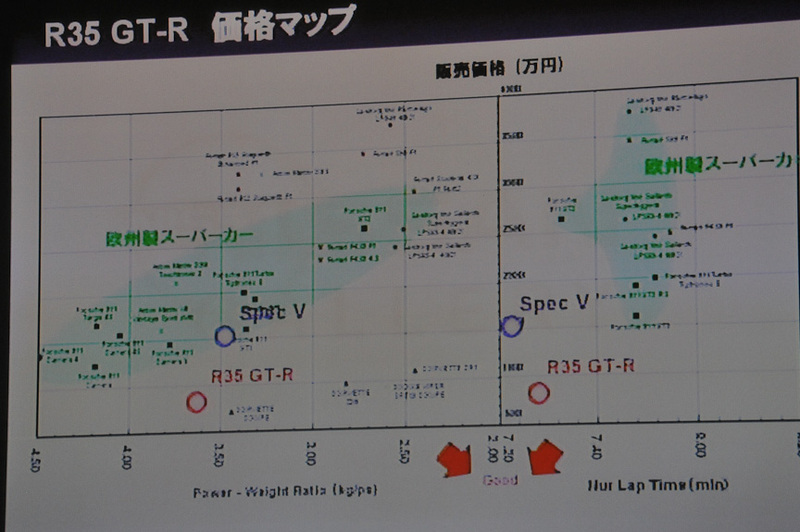 My Japanese is not what it used to be, but the folks on NAGTROC are speculating what this slide might mean.I talked with the US Product manager for GT-R last month during the LA Autoshow and he said that the tires alone are going to shave significant time as Dunlop has a new compound available that is good for as much as “4 seconds on a course the size of the Nurburgring”. We’ll have to see what they come back with in April, let the video be the proof. Boo-Yah! Craig gives us another stunner. Really hate that I missed this event, I hope to make the next one though. So I own both, a GT-R and a sportbike, so I can vouch for what they are identifying as the differences. Autocar does a phenomenal job of explaining how the two vehicles attack the track differently, though I have to admit the outcome was a bit of a surprise for me. R35 GT-R vs Ducati 1098- Video. Did Sam Hubinette throw the GT3 race??? Head to Head behind the scenes. Sam Hubinette & GT- Video. You are currently browsing the archives for the Tracks category.